The 32-year-old Froome joins Frenchmen Jacques Anquetil (1963) and Bernard Hinault (1978) as the only riders to win the Tour and Vuelta in the same year. Chris Froome was hailed in the British press on Monday for completing a historic Tour de France-Vuelta a Espana double but coverage of his feat was relatively low-key. The 32-year-old joins Frenchmen Jacques Anquetil (1963) and Bernard Hinault (1978) as the only riders to win the Tour and Vuelta in the same year. The Times called it a "monumental achievement" and The Daily Mirror said he had pulled off "one of the most outstanding feats in British sporting history". In the eyes of The Daily Telegraph, the four-time Tour de France champion now deserves to be considered "one of the greats, not simply of cycling but of British sport". The Guardian emphasized the role played by Team Sky and said Froome's dominance of stage races had "not been seen since Miguel Indurain's purple patch between 1991 and 1995". However, The Guardian was the only paper in which Froome's achievement was the leading sports story of the day, with football dominating elsewhere. Despite his phenomenal success, the quietly spoken Froome has never captured hearts in the same way as his charismatic former Sky teammate Bradley Wiggins. Explanations for his relative lack of popularity range from the fact he was born in Kenya to the doping suspicions that continue to swirl around his team. "Raised in Africa, resident in Monaco" was how The Times summed up how Froome is viewed in Britain. British former cyclist David Millar, writing in The Telegraph, said Froome "would probably admit deep down that he feels more African than British". In a piece entitled "So, why can't we warm to Froome?" The Mail's chief sports writer Matt Lawton said doubts about Sky's practices and doping in cycling in general were also held against the rider. Lawton said professional road racing was still perceived to take place against a "backdrop of suspicion". He also highlighted revelations about Wiggins's use of therapeutic use exemptions while racing for Sky and the team's failure to satisfactorily explain a mysterious package that was sent to him during a 2011 race. The Guardian's Will Fotheringham wrote: "Team Sky have singularly failed to endear themselves to those with a romantic vision of cycling or doubts over the sport's ethical issues". After winning his third Tour de France last year, Froome was surprisingly left off the shortlist for the BBC Sports Personality of the Year award. The award, voted for by the general public, rewards the outstanding performer in British sport in each calendar year. Millar said it would be "criminal" if Froome were not shortlisted this year. 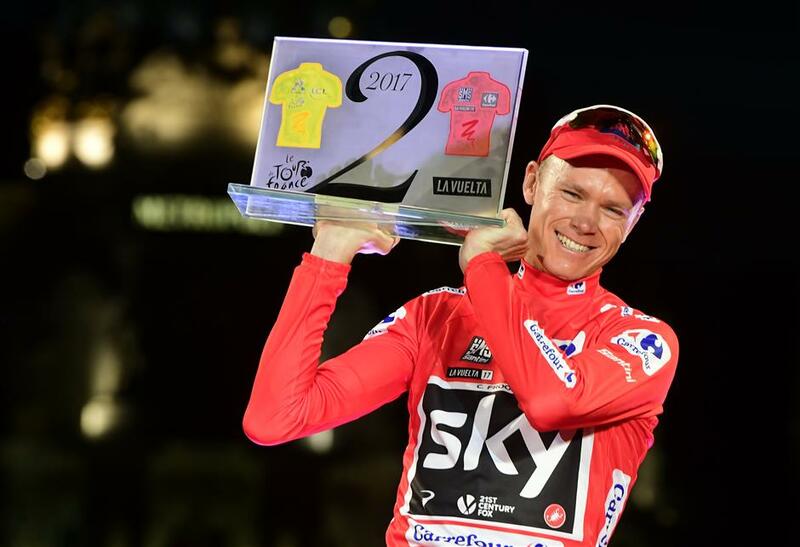 Froome is currently the second favorite to win the award behind Britain's world heavyweight boxing champion Anthony Joshua. When asked about his chances of winning this year's award, Froome told British papers: "I am not going to hold my breath." Team Sky rider Chris Froome of Britain celebrates on the podium after winning the Vuelta Tour of Spain after the last stage of the cycling race between Arroyomolinos and Madrid on September 10, 2017.